Conundrum Duo is one of Nova Scotia's most versatile ensembles performing classical, folk, and popular genres, but with a passion for Canadian new music! 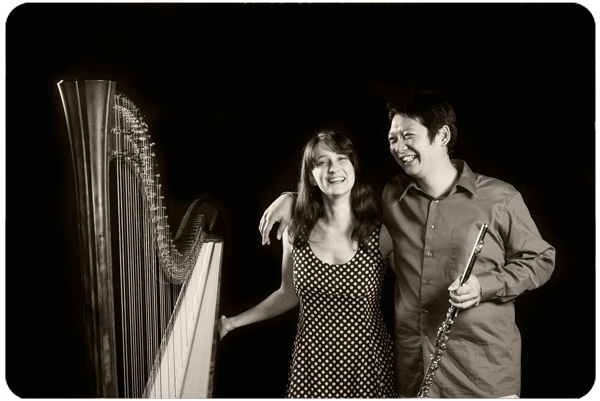 Building on the existing vast repertoire for the combination of flute and harp, the duo has expanded its horizons by collaborating with many artists including tabla player Shawn Mativetsky, violist Susan Sayle, soprano Janice Jackson, and Canadian woodwind quintet, Fifth Wind. The duo has been featured in concert series in the Maritimes including Inner Space Concerts, The Music Room Chamber Players, Musikon Concert Society, Musical Meet and Greet series, and Acadia Noon-Hour Concerts. Equally comfortable in and out of the concert hall, Ellen and Jack perform for many styles of events - school shows, community outreach concerts, weddings, seniors homes, theatrical productions, and more! The duo loves exploring new genres and new settings for this classic pairing. It is impossible for them to settle down and choose a favourite style, let alone a name that encompasses it all - hence, Conundrum Duo! All content © copyright Ellen Gibling 2015. Site graphics and design: Meredith Sadler. Hosting: Wavelength Media.